Here is a different version of GF Sandwich Bread. This particular version calls for ground millet and tapioca flour combination. I used my spice grinder to make the millet flour. The recipe has no corn, dairy, soy or refined sugar. It does have xanthan gum which is necessary to give the elasticity for rising, without xanthin the bread would crumble and break apart. So far I think this is my favorite. You won’t even know that it is gluten free. Well, that is what my husband said. that is two thumbs up. 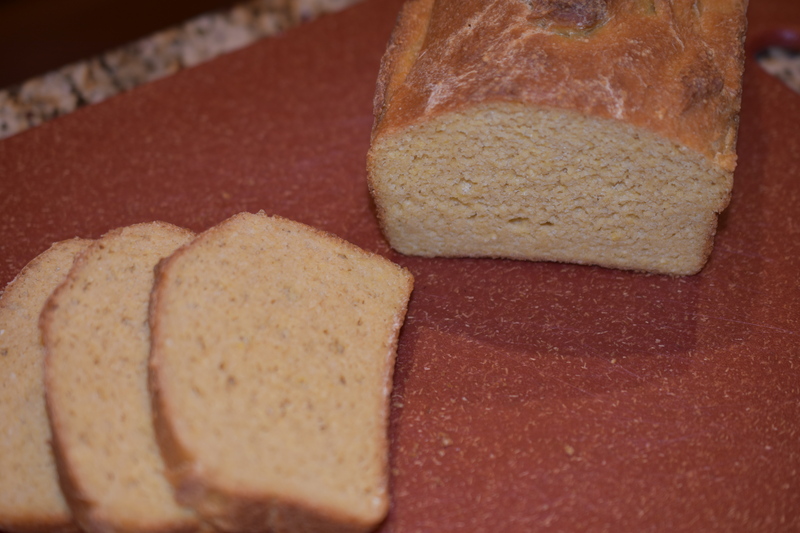 It has the perfect texture and bite of traditional bread. Grease a 8 1/2 x 4 1/2 loaf pan. Set aside. Whisk together yeast, honey and water in a measuring cup. Set aside and let the yeast do its thing. This takes about 5 minutes. In a large bowl (using a stand mixer) whisk millet flour, tapioca, coconut sugar, sea salt and baking powder. In a separate bowl whisk together eggs, avocado oil and apple cider vinegar. Change out whisk attachment to the paddle attachment. Starting on a low speed add yeast mixture and wet mixture to the dry ingredients. Increase speed to medium and mix dough until it is well blended. Dough will be thin. Spray plastic wrap with cooking spray. This will ensure the plastic wrap does not stick to the dough as it rises. Loosely cover dough with plastic wrap. I also draped a light towel over the plastic wrapped loaf pan. Preheat oven to 350 degrees. Remove plastic wrap from loaf pan. Bake until bread sounds hollow and is golden brown, about 45 minutes. If you notice that the bread is getting too brown cover the top of the bread with piece of aluminum foil. Remove from oven, and let loaf pan cool on wire rack for about 5 minutes. Turn loaf out onto cooling rack. Let bread cool completely. Slice bread with serrated knife. Thank you mistimaan. I am really enjoying this homemade bread. Thank you Diane. It was so good I made a mother loaf today. I can’t wait to retire so I can get back to bread baking!